We are happy to say that McCraw's Taffy is back! Everyone remembers this old time candy for being a giant flat taffy wrapped in a wax paper. This taffy comes and goes through out the years, but we are happy to say it is available again and as good as ever. This flat taffy is very thin and some what brittle. As you chew it , it becomes soft and chewy with great flavor. This is one of those candies that at one time could be found in every country store right along with homemade jams and jellies. Although now it has become a hard to find candy. 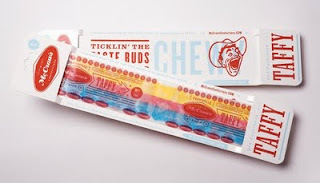 It has been called giant taffy as each bar is almost 12 inches long. 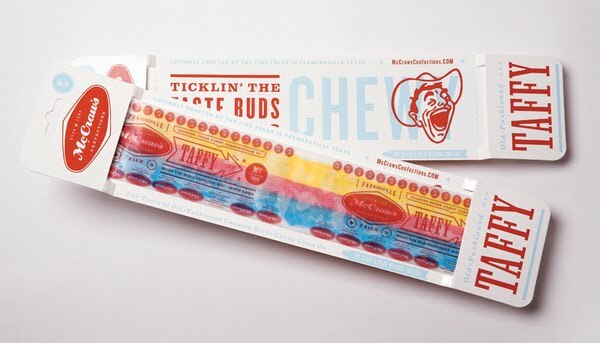 That gives you a lot of chewy fun and makes it great for sharing. These is one of those old time treats that you can't help but smile and talking about down memory lane when you see it. I can remember eating these as a kid, it was one of those candies my mom and dad would always let my sister and I buy as we could share it and then of course mom and dad had to sneak a few pieces. We are happy to see Mc Craws taffy has come back to many times these candy companies get rid of the great old time candies from the past. Don't get me wrong I love candy and it is always fun to get something new in our online candy store, however there is just something about be able to once again get the candy we ate as kids. If you are in search of this flat taffy you can buy it at our online candy store along with other retro and nostalgic candy you to ate as a kid.